Designed to replace outdated mechanical products still in the field this 14,300lb (6500kg) Dynamometer, the “BlueLink” is the latest SP product to feature our proprietary Bluetooth wireless technology. 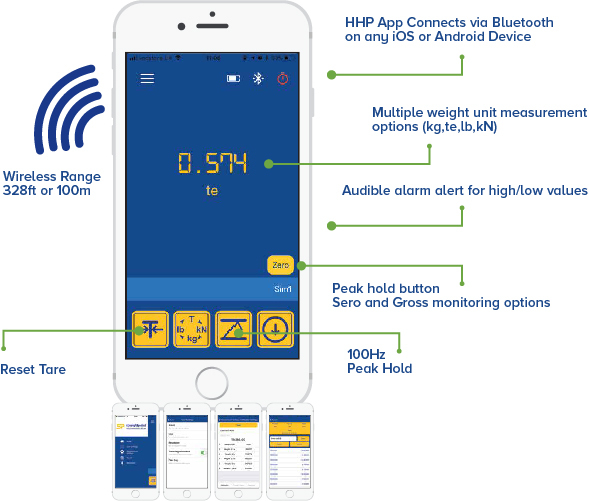 The Bluetooth signal effortlessly connects to any iOS or Android smartphone that has our free HHP app installed and provides the operator a wireless range of up to 328ft or 100m – allowing them to stand themselves in a safe position from the load with no requirement to read a load on the loadcell itself. The app will also allow the operator to log data versus time or on events such as over or underload and the adjustable alarm will alert the operator on their smartphone if any overload is occurring. 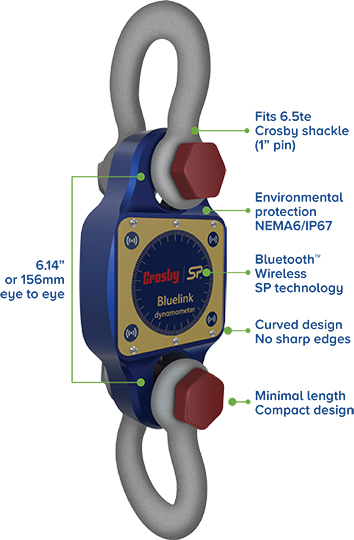 Rigged using industry standard shackles such as Crosby G2130 the Bluelink has been designed to minimise headroom (just 6” or 156mm from eye to eye) and its compact lightweight design does not sacrifice on strength with a safety factor of over 500%. Constructed from high quality aerospace grade aluminium and hard anodized it features an advanced internal design structure. 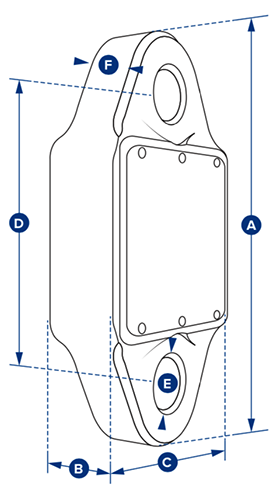 This design not only provides the product with an unrivalled strength to weight ratio, but it also allows the use of a separate internal sealed enclosure providing the load cell's electronic components with NEMA6 or IP67 environmental protection even with the battery cover plate missing, making this industry compact dynamometer even more suitable for use in the harshest industrial or leisure environments. 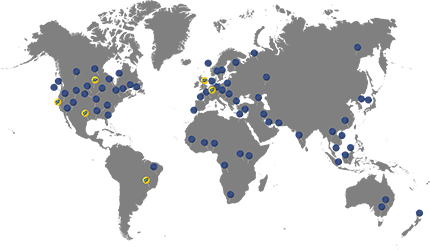 The BlueLink is powered by four x standard AA alkaline batteries that provide in excess of 500 hours transmission time and its internal antennae ensures loads to an accuracy of 0.1% FS are transmitted safely. Precision field testing of chain, rope, wire. Material of construction: Aluminium 2014-T6. Finish: Blue anodized to BS EN 12373-1:2001 Class 10.